TULSA -- Tulsa Public Schools is looking to bring aspiring teachers to a six week training program this summer, and this year the participants will be paid. "It is hard work and the teachers work really hard so I knew it was something I wanted to do," said Jasmine Newton, who enrolled in Tulsa Teacher Corps. In this school year alone, the state issued nearly 3,000 emergency teacher certifications. Some parents worry if they're truly qualified to be head of the classroom. "Teaching is a calling and a noble profession so we want to make sure anyone who feels the call has the opportunity to work with us throughout their time here in Tulsa Public Schools," said Quentin Liggins, Director of Talent Acquisition, Retention, and Development for T.P.S. T.P.S. is working ahead to make sure their teachers are trained properly. For the second year they're holding Tulsa Teacher Corps, a six week preparation program for aspiring teachers. "We’re already trending ahead of where we are, we’re very aggressively growing the corps because our need is so great," said Liggins. The 80 already enrolled in this summer's program either have some experience in a classroom, or making a complete career change. "It’s crazy to see the backgrounds that we’re coming from and we just want to go in and help next generations because there’s a need for it," said Newton. Newton is graduating with a Bachelor's in Psychology, with intent to get her Master's to be a school counselor. "You have to have a heart for it, and I have a heart to help kids, I really want to help kids build good foundations," said Newton. 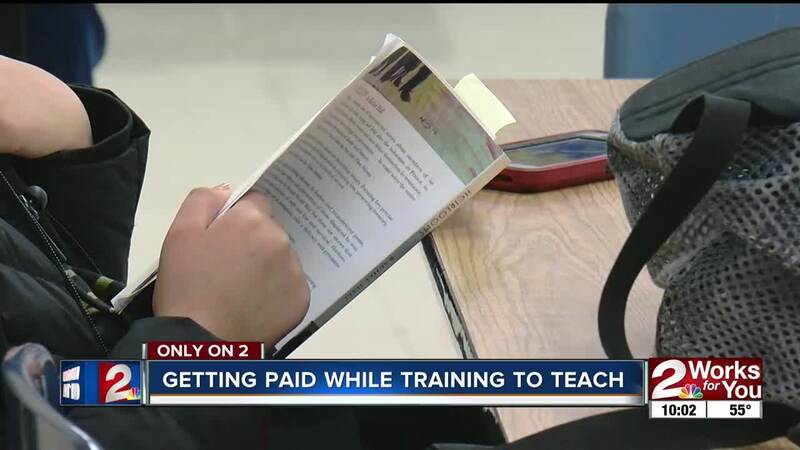 Last year the participants were not paid during the six week training, but this year the Tulsa Board of Education approved out of the general fund to pay each person $120 per day. "Whenever I received the email and I was like wow that’s an added bonus to the fact that we’re going to already be there to actually get the training we need," said Newton. The district is hoping the extra cash will encourage more to sign up. They're looking to fill about 45 more spots. Before being considered to teach in the district, the participants have to pass a performance bar at the end of the program. The application process closes April 15. The first day which will consist of on-boarding is June 6, and June 10 is the start of two weeks which focus on professional development. The remaining four weeks they'll be working with young students in a summer school setting, which ends July 19. Click here to apply, or to find more information on the program.